Golagamudi Sri Venkaiah Swamy Temple is dedicated to a great Sage and Avadhuta called Bhagavan Venkaiah Swamy. Bhagavan Sri Venkaiah Swamy is a famous spiritual saint who lived at Golagamudi village in Venkatachalam Mandal near Nellore city. All devotees irrespective of their caste, creed and religion worship Venkaiah Swamy at Golagamudi. Avadhuta Sri Venkaiah Swamy was born at Nagulavelluthru village to Sompalli Pitchamma and Penchalaiah. Satguru Venkaiah Swamy is the eldest son of the family. He had two brothers and a sister. As a small boy he used to love loneliness and meditation. At the age of 16, Venkaiah Swamy used to collect banyan leaves (used for making leaf plates) and cut firewood in the nearby jungle and carry it by bullock cart to Nellore city and sell there. He carried out all agricultural activities with great enthusiasm and received compliments from his parents and elders. In those days he used to work in the fields for daily wages as well. From the childhood, he always like to speak the truth. His behavior was completely changed at the age of twenty, when he suffered from fever for a week. Venkaiah started speaking insane words and asked their parents "where you will live if our house is auctioned?". The family has no debts so they concluded he was behaving abnormally because of high fever and started doing all sorts of treatments. After a month of treatment, he started running in the streets shouting loudly saying "Zakkala Yoga", "Chakala Yoga" and "Mangala Yoga" "Dubuduck Dubuduck..". He avoided going to the house and stayed in lonely places. At this stage people used to call him mad Venkaiah and did not care much about him. He used to take food at his sister Mangamma's house and started showing his super human powers by predicting what she thinks in her mind. Suddenly he disappeared from his village and later appeared in the nearby village after four or five years. He ran away from his home to nearby Penchalakona forest area and has met his Satguru there. Many local villagers considered him as a madman, but didn't understand that he has reached the stage of "Avadhoota". Acharya Sri Ekkirala Bharadwaja Master (Saimaster), who is an ardent Shirdi Sai Baba devotee recognized Golagamudi Venkaiah Swamy as a great Avadhoota. 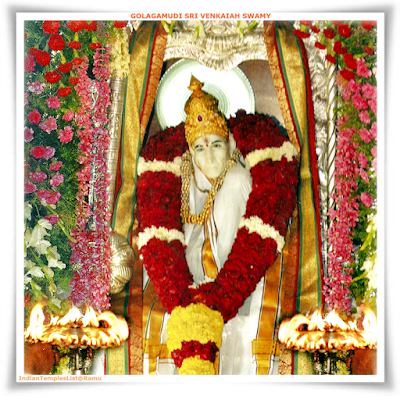 He encouraged many devotees to visit Golagamudi and get the blessings of Bhagavan Venkaiah Swamy. Sri Venkaiah Swamy lived a very simple life and eat food by doing Bhikshatana. Avadhuta Venkaiah Swamy has attained Maha samadhi and left this world on 24 August 1982, but his miracles can be felt even for today. He cured many disease during his lifetime and is protecting his devotees even for today in mysterious ways. Golagamudi is just 12 km away from Nellore district of Andhra Pradesh state in South India. Golagamudi is 30 km away from Gudur town. Tirupati is at a distance of 127 km from Golagamudi. Official language spoken at Golagamudi is Telugu. Pilgrims can easily reach Golagamudi Venkaiah Swamy Temple from Nellore. Pilgrims need to reach Nellore by bus or train and from there it is easy to reach Golagamudi by bus or taxi. APSRTC is operating frequent buses to Golagamudi from Nellore city. All major cities of Andhra Pradesh are well-connected to Nellore city by road. VKT/Venkatachalam railway station is the nearest railway station at a distance of 8.3 km from Golagamudi. People coming from Chennai and Tirupati can get down at Venkatachalam. Also, visitors can reach Nellore city as Nellore railway station/NLR and Vedayapalem/VDE is well connected to all major cities of the country. The nearest airport is present in Tirupati as Nellore city does not have an airport. The distance between Nellore and Tirupati was about 102 km. Morning Abhisekam is performed at 4:30 AM every day. The holy water used in the Abhisekam is given as Theertham to the devotees. 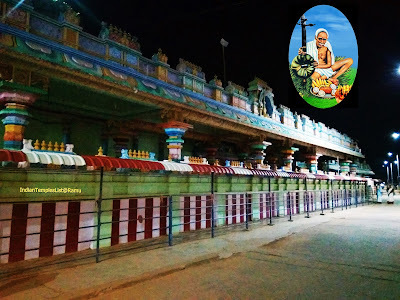 Golagamudi Sri Venkaiah Swamy Sarva Darshanam starts at 6:30 AM. The temple Samadhi Mandir will be closed for darshan after Night Aarti. Golagamudi temple timings are given in the following table. The timings may change over time and readers are advised to visit the official website for latest temple timings. Golagamudi Ashram administration is offering different kinds of accommodation. Based on your budget you can choose guest house, AC and non-AC rooms. Piligrims can also get decent budget hotels with good accommodation facility at Nellore city. Every Saturday evening Vuyyala Seva is performed to Bhagavan Venkaiah Swamy at 7:30 PM and Pallaki Seva is performed at around 8:30 PM. Aradhana Utsavam is celebrated in the month of August. The Utsavam is celebrated for a period of five days and free food is served for the devotees during this period. Lakhs of devotees from all corners of India pay a visit to Golagamudi and participate in different sevas like Garuda Vahana Seva, Rathotsavam, Aswa Vahana Seva, Sesha Vahana Seva, Gaja Vahana Seva and Theppotsavam. Food is served daily to each and every devotee who visit the Golagamudi temple. Note: Contact details provided here may change over time. Please, check with the website for more details. There are many ancient historic temples to visit in and around Golagamudi. If everyone who read this post, share this information with other like-minded friends, help us reach more blog readers and provide better temple posts in the future. Your helpful comments, questions and suggestions are highly appreciated.